Fixing issues in Siebel Open UI is really fun. Well, let me explain you why so. Have you noticed such behavior in Siebel Open UI where ‘Case Required’ prompt is displayed for all fields on home page search applet? In SupportWeb, Oracle has reported this symptom as ‘There is inconsistent UI behavior between home page search applets and regular form/list applets when the field is reconfigured to support case insensitive searches’. 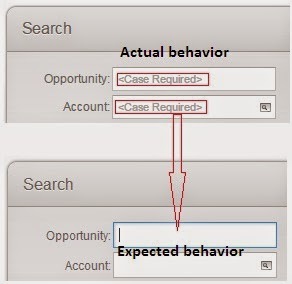 Now see the below screenshot, you can see ‘‘ prompt for Opportunity name and Account name field but expected behavior is that there will not be any such prompt as those are not case sensitive search at all. Oracle has taken this one as product bug (BUG #19001914) and stated like ‘This is a cosmetic issue as searching against the fields in the home page search applet will still be case insensitive, Until a fix for this is available there is no workaround’. But do not wait for their work around, we can fix it within few minutes. Follow below steps to fix it. 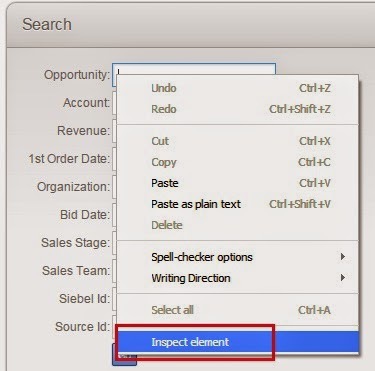 – Inspector window will keep the corresponding script highlighted under Elements tab. If it is not highlighted, then again right click on the field and choose ‘Inspect Element’ option. From the script, you get to know that class ‘siebui-watermark-text‘ is responsible to display ‘‘ tag in watermark. – Find the string ‘siebui-watermark-text’ and change the color code from ‘#C0C0C0’ to ‘#FFFFFF’. ‘<Case Required>‘ is gone from search applet!! Same way, you can change field text color, font, background color and many more. To get more details, read our article on Siebel Open UI theme. If you face any problem, please let us know. For more updates on recent activities, follow ‘TechOneStop‘ on Facebook / Twitter / LinkedIn or join our website as follower.